I'm sure that enough people write daily in their blogs about the horrible experiences they've had with various customer service organizations. I'm going to tell you about two great experiences I had just today. Two "big box" stores even. Aren't we supposed to be going to smaller, mom & pop shops to receive better service? I don't know if I could have received better service than I got today from Staples and Home Depot. Recently, I've been purging. Purging junk. Purging junk from my life that I've held onto for whatever reason; probably because I just had space to do it. Currently in my hallway, there are about 8 garbage bags full of crap that I'm throwing away. Don't worry, I gave all the clothes that were fit to give away to Big Brothers/Big Sisters, and I'm recycling all my cardboard boxes, so all you hippies don't give me any grief. During this process, I've come across various personal documents that I felt should be shredded rather than just thrown away. Well, yesterday my shredder decided to give up the ghost. There was an audible pop, the lights dimmed for a split second, and my shredder had ceased to shred. And it would shred no more. I had owned it for almost a year, I thought, but I wasn't positive. I had shredded the receipt to test it when I first got it, so I knew that was out of the question. Luckily, it was a Staples branded appliance, so I thought I would take my chances in seeing if they'd exchange it or replace it. Today, I carted it back over to the store in Bayers Lake, fully expecting to have to argue about this in order to get it exchanged. 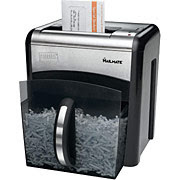 I walked over to the customer service desk and explained the situation, my shredder had simply stopped working. The manager of the store happened to be nearby when I was talking to the girl serving me, and I thought he was going to start making things more difficult, but he didn't even ask for my receipt or credit card or anything, he just walked over, grabbed a brand new one, and I was out of the store within 5 minutes of walking in. It was one of the most pleasant customer service experiences I have ever had. 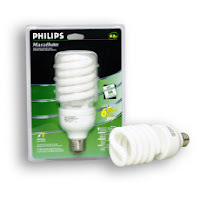 One of the other ways I'm trying to improve things is by using CFL (compact fluorescent light) bulbs wherever possible. The light fixture in the middle of my stairwell had 4 out of 5 bulbs burnt out, and finally it was time to replace them, lest I be left literally in the dark. I went to Home Depot and bought 5 of what I thought were the most appropriate CFL bulbs for the job, and came home to install them. I found that although the screw part was the right size for the fixture, the narrow shades affixed to where each light is supposed to go prevented me from fully installing the CFL bulbs. I would have to take them back. I drove back to Home Depot to pick up the identical incandescent bulbs that had just burnt out...At least I know that they fit. Unfortunately, I had managed to lose my receipt in the nominal amount of time I had actually spent with these bulbs outside the store. I decided to try to take them back anyway. After all, the cashier who sold them to me was probably still working there, and at least she could vouch that I wasn't trying to rip anybody off. But I needn't have worried: The returns desk at Home Depot was able to look up my purchase based on my credit card number and no receipt was necessary. Why don't more stores do that? I walked out with bulbs that I knew would fit my light, and all was well. Anyway, I hope I have brightened somebody's day with the notion that customer service can actually be had in this day and age, even in big box stores. Oh, and did I mention that I didn't wait in any line ups whatsoever at either customer service desk? Crazy, I know. Hmmm.. the "big box" stores definitely have few issues, but i have come across Bigboxstore website which i had a pleasant experience with. These store sell wholesale electronics.